Nature's Challenge to Every Golfer, River Bend Golf Club is the premiere public 9-hole facility of the greater Chicago area located in the western suburbs. Our course is nine holes of bent grass tees, greens and fairways. The layout features scenic wetland areas with water and/or wetlands coming into play on eight out of nine holes. Our PGA approved, par 36 design has a 70.8 rating and slope of 126 from the blue tees and stretches from 2,600 to over 3,300 yards from the back tees. Four sets of tees allow all skill levels to play an enjoyable round. 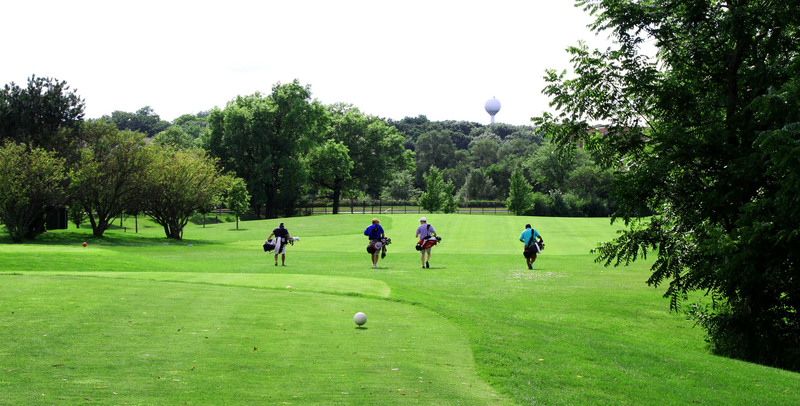 River Bend Golf Club was singled out as one of Chicagoland's best 9-hole public courses in 2012. The golf course was designed by William J. Spears and first opened for play in 1993. River Bend is conveniently located in the western suburbs of Chicago near the I-88 and I-355 toll roads. Gas carts, golf bikes, pull carts, and club rentals are available. The Pro Shop at River Bend Golf Club features a select line of apparel and golf accessories and locker rooms are available at no charge. After a round of golf, enjoy a meal and drink at our full-service public restaurant, Wheatstack – A Midwestern Eatery & Tap. Located in the clubhouse, Wheatstack features great food, an excellent bar and large raised deck overlooking the golf course with spectacular views. During the winter months, enjoy meals before the cozy stone fireplace. A golf course flyover is a virtual tour showing every hole of a golf course as if you were riding in a helicopter stopping at each tee, fairway and green for a closer look. From tee to green, our golf course flyover gives you an in-depth look from hole one to nine showing the distance and layout of the course so you can plan your shots before stepping foot on the course. Environmentally sensitive areas are to be treated as water hazards. A ball coming to rest in these areas cannot be retrieved and must be abandoned. Play a new ball as near as possible to the point where the original ball entered the hazard with a penalty of one stroke. Every golfer must have a set of clubs, a putter, and a golf bag. No coolers are allowed. All alcoholic beverages consumed on property must be purchased on the property. The maximum number of players allowed per group is four. A maximum of two players are allowed per golf cart. Proper golf attire is required at all times. No caddies or spectators are allowed on the course. Must be 18 years or older to operate a riding cart. Golfers are responsible to damages to riding cart. Golfers may have only one ball in play (per the USGA RULES OF GOLF). Practice on the golf course is prohibited. River Bend is a Pace of Play Facility. Please play without delay and observe proper golf etiquette. Golfers are monitored with a maximum time of 2:30 to complete nine holes. Lightning Warning System: 3 blasts indicate evacuate course, 1 blast indicates resume play. All carts must remain at least 30 yards from greens and on cart path around tees. Gas cart availability is based on weather and course conditions. Pull carts and golf bikes must be kept off tees and greens. Management reserves the right to refuse golf privileges to anyone not obeying posted rules and/or not obeying course personnel. River Bend reserves the right to match players to fill foursomes or tee times. Players must repair their divots, ball marks on greens, and rake sand bunkers. USGA rules govern play except where modified by local rules. Guests are reminded to not leave golf bags or personal belongings unattended. River Bend is not responsible for any lost or stolen property. Lost & Found: Found items will be stored up to a maximum of 60 days. Found items must be clearly described by claimant in order for the item to be released. Smoking is not permitted in the clubhouse, deck or within 15 feet of the clubhouse. Please be courteous with your cigarette/cigar butts while on the course. Remember, cigarette butts are not biodegradable, blemish the landscape and detract from the enjoyable use of the course by other golfers. River Bend Golf Club is an avid supporter of green initiatives and is thrilled to offer rentals of The Golf Bike, an eco-friendly alternative to the traditional gas cart that promotes a healthy lifestyle and allows cycling enthusiasts an opportunity to combine two of their favorite activities. 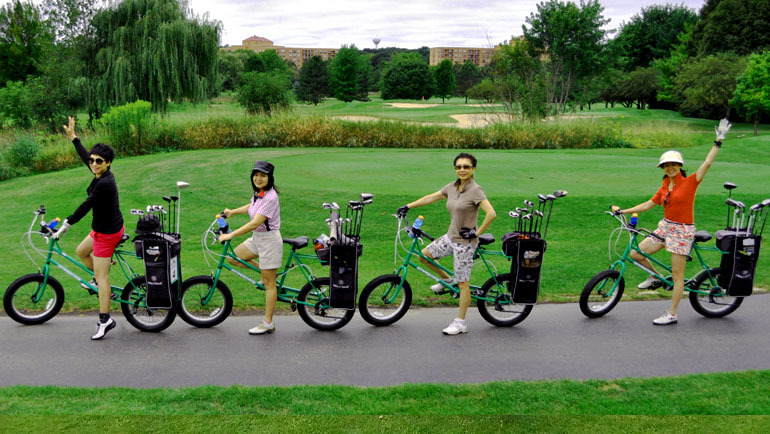 The Golf Bike has been enthusiastically accepted by the golf industry and is currently being used on courses in the United States and Canada. To learn more about The Golf Bike, visit thegolfbike.com. The golf bikes are AMAZING!!!! Very easy to ride and perfect exercise combining cycling and golf. This is a UNIQUE place. Everyone is so friendly! Mike the starter is fabulous! The food is amazing! The drinks are cold! The golf is GREAT! Very nice 9 hole course. Scenic views, nice blend of holes, 5 par 4s, 2 3s, and 2 5s. Greens are big and roll very well. Nice job of maintaining the environment in and surrounding the course. Reasonable price, all in all a winner. Have never seen bikes offered on a course before. The course is very scenic and to golf and ride in the fall would be wonderful! 9-hole public golf course in the western suburbs of Chicago, IL, near the intersection of Interstate 355 and Interstate 88.